Since Trump’s election in November, that same idea had inspired more than 4,000 women to contact EMILY’s List, an organization that backs female pro-choice candidates across the United States, about running for office. It had compelled women to organize a series of marches that brought millions of anti-Trump protesters into streets around the world. The other day, I went into a favourite local boutique just to say hi. A woman was standing at the counter, berating the very young clerk behind the counter. Why? Because, in the window display, was a roll of toilet paper with the orange madman's image on it. The woman was furious. Tha't disrespectful, he's our president. I just came from a meeting learning all about how wonderful he is. He is the president of all of us. Get that thing out of the window. He deserves respect." Well, we all know what a quiet, gentle, non-confrontational soul I am. . . . I said, "did you say that every time someone disrespected President Obama? If not, you have no moral ground to stand on" She sputtered, and I repeated the question. She finally said, "I never said anything against him". I replied, "but did you stop, or criticize, those who did?" She did not answer, so I said, "you are answering my question by your silence. So, you are a blatant hypocrite, and, again, you have no moral standing. Now leave the clerk alone"
This very tall, very angry woman, stormed past me to leave. I HATE when people try to bully staff. And, incidentally, the owner of this shop is a very strong progressive. I LOVE it when I am provided with human scratching posts!! We should view all the stories about Russia and Trump as part of a whole. To facilitate that, I made an outline of the (1) evidence and (2) people/businesses linking Trump to Russia. Almost all this information comes from mainstream media sites. Almost every sentence is cited. Extensive Russian Business Connections: Even before the 2000’s, Trump rented posh apartments to Russians mobsters. [TAI]. But Trump’s Russian connections were limited until he became a bad credit risk. [FT]. From 2004 to 2009, two Trump businesses entered bankruptcy and he was unable to pay off a $40 million bank loan. 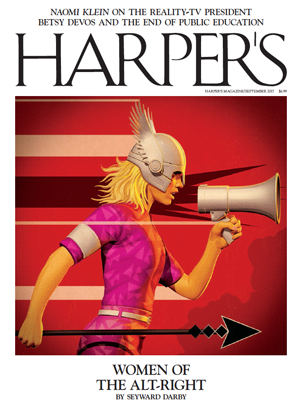 [Newsweek]. As banks stopped lending to Trump, he was forced to seek capital from billionaire kleptocrats and oligarchs in the former Soviet Union and Russia. [TAI]. These billionaires were eager investors in the Trump Organization, and as Trump’s son asserted in 2008, “a lot of money [was] pouring in from Russia.” [CNN]. Recently, Reuters estimated that Russians have purchased, at the very least, $98 million worth of lots in Trump Towers in Florida alone. In addition, a one Russian oligarch bought a Trump mansion for $95 million in 2008. [FT]. Trump’s business with some of these oligarchs and kleptocrats continued until he ran for president. [see e.g. WaPo (2013 Moscow Beauty Pageant); NYT (Moscow Tower plan for 2015)]. 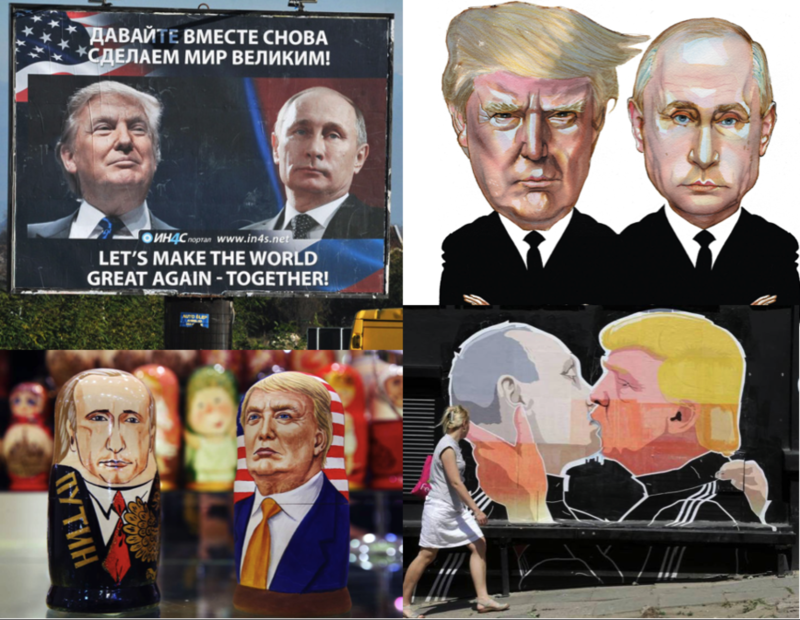 During the Campaign: Putin directed Russian intelligence to help the Trump campaign by hacking Democrats’ emails, leaking these emails via WikiLeaks, and flooding social media with anti-Hillary propaganda. [NYT]. Such influence by a foreign power was unprecedented in a US presidential election. [Reuters]. Perhaps coincidentally, Trump’s campaign regularly communicated with Russian officials and, quite likely, senior Russian intelligence officials. [NYT; CNN]. Moreover, campaign members had suspicious connections with organizations tied to Russia. For example: (1) during the campaign, Roger Stone served as a “back-channel” to WikiLeaks and a Twitter account run likely run by Russian intelligence agencies, [Guardian(WikiLeaks); [WashTimes(Guccifer)]; (2) in 2015, Michael Flynn was paid at least $68,000 by Russian entities, including over $45,000 by RT and $11,250 by a Russian cybersecurity firm, [WaPo]; (3) in October 2016, Trump Jr. was paid at least $50,000 for attending private discussions hosted by a pro-Putin Syrian think tank, [WSJ]; and (4) years earlier, Manafort was paid 12 million dollars in off-the-books cash in exchange for working for a pro-Putin Ukrainian party, [NYT]. Also, during the campaign, a former British spy sent the FBI a dossier claiming Trump colluded with Russia, which allegedly had bribed and blackmailed him. [NYT; Buzzfeed (for dossier)]. Trump’s Transition and Presidency: After Trump won the election, he picked nominees with ties to Putin and Russian oligarchs, such as Rex Tillerson and Wilbur Ross. [CBS; MotherJones]. He also picked Flynn for National Security Advisor, who during the transitions, infamously discussed sanctions with the Russian ambassador over five phone calls on the day they were announced by Obama. [Reuters]. Trump shares Flynn’s concern with sanctions, and has persistently advocated removing them and working with Putin. [see e.g. Reuters, Politico]. However, Trump has been preemptively thwarted by Congress. [USAToday (many Republicans have voiced support for sanctions)]. US Intel Agencies and Allies: Officials in US intelligence agencies strongly suspect collusion between Trump and Russia, [Haaretz; WSJ], as do our Western European and Baltic allies, [Newsweek]. They have investigated Trump’s associates and uncovered many suspicious contacts with Russian officials. [Newsweek; NYT; CNN]. (CNN)It's been nearly a week since a self-described fan of Donald Trump walked into a mosque in Quebec City and opened fire, killing six worshipers. The President has, at the time of writing, yet to publicly acknowledge the massacre, let alone offer any public words of condolence. Thus far, the only mention of the tragedy by the White House has been by Trump's Press Secretary, Sean Spicer, who, in a mind-boggling display of disinformation, called it "a terrible reminder of why we must remain vigilant and why the President is taking steps to be proactive instead of reactive when it comes to our nation's safety and security." Spicer's statement left the press corps baffled. He seemed to be suggesting that a far-right, ultra-nationalist, white supremacist, radicalized by social media into murdering Muslims, somehow proved Trump's position on the need to focus on the threat of Islamic terrorism. As Philip Bump of the Washington Post put it: "The clear implication was that the incident in Quebec proved that his actions on terrorism and immigration were necessary, though it's not clear how that is the case." Well, we now have some sense as to why the White House has not only been silent about the Quebec City massacre, but has used it to advance what the New York Times calls a "deeply suspicious view of Islam" indicative of a troubling "strain of anti-Islamic theorizing." An exclusive report by Reuters suggests the White House is planning to "revamp and rename a US government program designed to counter all violent ideologies so that it focuses solely on Islamist extremism." According to Reuters, the program, "Countering Violent Extremism" will be renamed "Countering Islamic Extremism" or "Countering Radical Islamic Extremism," and will reportedly "no longer target groups such as white supremacists" who have been responsible for the vast majority of terrorist attacks on American soil in the last 15 years. In Trump's world, it seems, the only extremism that matters is Islamic extremism. Americans are almost seven times as likely to be killed by a white extremist than by an Islamic one, according to one study. According to the Southern Poverty Law Center, there were 42 militia groups in 2008; today, there are 276. Meanwhile, anti-government groups grew to 998 in 2015 (https://www.splcenter.org/active-antigovernment-groups-united-states), while the number of right-wing hate groups grew from 784 in 2014 to 892 in 2015 (https://www.splcenter.org/fighting-hate/intelligence-report/2016/year-hate-and-extremism). According to the Anti-Defamation League, "domestic extremist killers" killed more people in 2015 than any other year since Oklahoma City in 1995 (In fact, here is a list of radical right wing terrorist plots, conspiracies and attacks since 1995 https://www.splcenter.org/20100126/terror-right#Terror). These facts explain why, according to the Triangle Center on Terrorism and Homeland Security, "law enforcement agencies in the United States consider anti-government violent extremists, not radicalized Muslims, to be the most severe threat of political violence that they face." Indeed, in a survey the New York Times conducted in 2015, "74% of law enforcement agencies reported anti-government extremism as one of the top three terrorist threats in their jurisdiction." So, considering the facts, why might the White House choose to stop targeting what is almost unanimously considered to be the gravest domestic terrorist threat to Americans and to focus instead solely on Islamic terrorism? The answer is simple: Trump is playing to an influential part of his constituency. After all, these people form the radical core of his political support. They are the people who helped put him in the White House. A student has launched an online campaign to ensure that women are represented on Edexcel’s A-level music syllabus, which currently features 63 male composers and no female ones. Seventeen-year-old Jessy McCabe noticed the lack of female representation on the exam board’s music syllabus after participating in a programme on gender inequality. 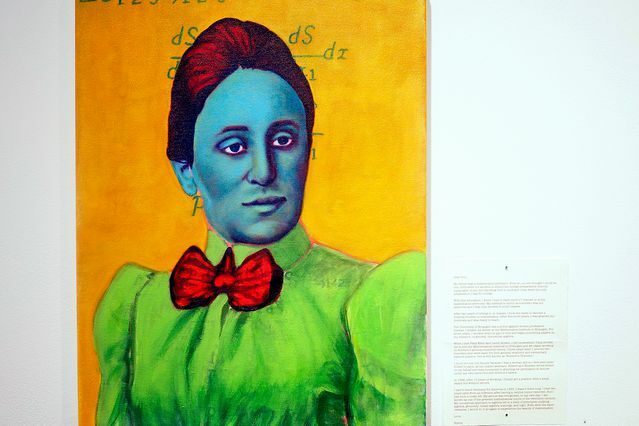 Emmy Noether was one of the most brilliant and important mathematicians of the 20th century. She altered the course of modern physics. Einstein called her a genius. Yet today, almost nobody knows who she is. In 1915, Noether uncovered one of science's most extraordinary ideas, proving that every symmetry found in nature has a corresponding law of conservation. So, for example, the fact that physical laws work the same today as they did yesterday turns out to be related to the notion that energy can neither be created nor destroyed. Noether's theorem is a deep insight that underpins much of modern-day physics and things like the search for the Higgs boson. "Despite her brilliance, universities didn't want to hire a woman"
Even so, as one of the very few female mathematicians working in Germany in her day, Noether faced rampant sexism. As a young woman, she wasn't allowed to formally attend university. Even after she proved herself a first-rate mathematician, male faculties were reluctant to hire her. If that wasn't enough, in 1933, the Nazis ousted her for being Jewish. Even today, she remains all too obscure. That should change. So it’s welcome news that Google is honoring Noether today with a Google Doodle on her 133rd birthday. To celebrate, here's an introduction to the life and work of a woman Albert Einstein once called "the most significant creative mathematical genius thus far produced." Her work got noticed, and in 1915, the renowned mathematician David Hilbert lobbied for the University of Göttingen to hire her. But other male faculty members blocked the move, with one arguing: "What will our soldiers think when they return to the university and find that they are required to learn at the feet of a woman?" So Hilbert had to take Noether on as a guest lecturer for four years. She wasn't paid, and her lectures were often billed under Hilbert's name. She didn't get a full-time position until 1919. That didn't stop Noether from doing trailblazing work in a number of areas, especially abstract algebra. Rather than focusing on real numbers and polynomials — the algebraic equations we learn in high school — Noether was interested in abstract structures, like rings or groups, that obey certain rules. Abstract algebra was one of the big mathematical innovations of the 20th century, and Noether was hugely influential in shaping it. Here's an example: Let's say we conduct a scientific experiment today. If we then conduct the exact same experiment tomorrow, we'd expect the laws of physics to behave in exactly the same way. This is "time symmetry." Noether showed that if a system has time symmetry, then energy can't be created or destroyed in that system — we get the law of conservation of energy. "Noether had linked together concepts as different as energy and time"
Likewise, if we do an experiment, and then do the exact same experiment again 20 miles to the east, that shouldn't make any difference — the laws of physics should work the exact same way in both places. This is known as "translation symmetry." Noether showed that translation symmetry leads to the law of conservation of momentum. Noether worked at the Mathematical Institute of Erlangen, without pay or title, from 1908 to 1915. 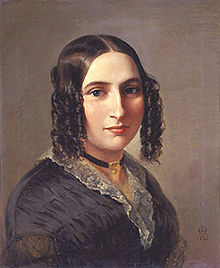 It was during this time that she collaborated with the algebraist Ernst Otto Fischer and started work on the more general, theoretical algebra for which she would later be recognized. She also worked with the prominent mathematicians Hermann Minkowski, Felix Klein, and David Hilbert, whom she had met at Göttingen. In 1915 she joined the Mathematical Institute in Göttingen and started working with Klein and Hilbert on Einstein's general relativity theory. In 1918 she proved two theorems that were basic for both general relativity and elementary particle physics. One is still known as "Noether's Theorem." During the 1920s Noether did foundational work on abstract algebra, working in group theory, ring theory, group representations, and number theory. Her mathematics would be very useful for physicists and crystallographers, but it was controversial then. There was debate whether mathematics should be conceptual and abstract (intuitionist) or more physically based and applied (constructionist). Noether's conceptual approach to algebra led to a body of principles unifying algebra, geometry, linear algebra, topology, and logic. In 1928-29 she was a visiting professor at the University of Moscow. In 1930, she taught at Frankfurt. The International Mathematical Congress in Zurich asked her to give a plenary lecture in 1932, and in the same year she was awarded the prestigious Ackermann-Teubner Memorial Prize in mathematics. 2002 – A female suicide bomber blows herself up at the entrance to Jerusalem's Mahane Yehuda open-air market, killing 7 and wounding 104. 1951 – Ethel and Julius Rosenberg are sentenced to death for spying for the Soviet Union. 1975 – Sarah Baldock, English organist and choral conductor. how many of these early black feminists do you know? Though black feminists have wielded social media to make willful strides into public consciousness, black feminism is nothing new. The challenge of being doubly oppressed as a black woman has always colored feminist conversations, and minority women rarely have the luxury of fighting solely on behalf of their gender. The question of intersectionality predates hashtags and Twitter feminism and goes all the way back to impasses such as the one between black journalist Ida B. Wells and white suffragist Frances Willard. Wells implored Willard to acknowledge the evil of lynching, while Willard, blinded by her race and class privileges, believed black men to be deserving targets. Though not always recognized, black women have always made forays into the feminist dialogue to ensure black women and girls don’t remain an afterthought. In celebration of Black History Month, here are 11 early black feminists, in no particular order—some you’ve learned about and some you probably haven’t. 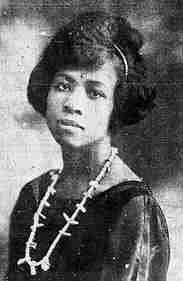 One of the most prominent black scholars in American history, Cooper was the fourth African American woman to earn a PhD when she graduated from University of Paris-Sorbonne in 1924. Having been born in slavery in Raleigh, N.C., Cooper used both her lived experience with racism and her scholastic ability to pen her first book in 1892, A Voice from the South: By a Woman from the South. The book, in which Cooper argued for the self-determination of black women, is considered the first volume of black feminist thought in the U.S.
An abolitionist and women’s rights activist, Truth was also born into slavery, but escaped with her young daughter. She later went to court to obtain freedom for her son, becoming the first black woman to win such a case. Her famous speech on gender inequity, “Ain’t I a Woman” was delivered in 1851 at a women’s rights convention in Akron, OH, and has endured as a raw and powerful utterance of the tribulations and burdens black women shoulder. 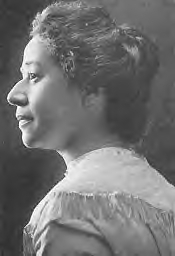 An activist for civil rights and suffrage, Terrell was one of the first African American women to earn a college degree when she graduated from Oberlin College in 1884. A close of acquaintance of Frederick Douglass and Booker T. Washington, she campaigned for racial equality, becoming a well-known activist in Washington, D.C. A writer and the first president of of the National Association of Colored Women, many of her works, including “A Plea for the White South by a Colored Woman” and “A Colored Woman in a White World,” focused on the status of black women in society. Terrell was also a founding member of the NAACP and helped organize the black sorority Delta Sigma Theta.